How do my phone company and ISP relate? While it's common that they are, your phone company need not be your ISP. I'll look at how they relate and what happens when you change. I've moved to my first home. I had my landline installed by a telephone company after I moved. That phone provider unexpectedly set up my internet connection also when he was in my house. I was assuming that I would have to call my original ISP and go through a step-by-step procedure to reestablish my internet connection. I've had the same ISP (different from the phone provider) for eight years. How can my email address with a domain name different from the phone company be working on the phone company's system? I'm currently being charged by both my original ISP, whom I have never called to reconfigure my connection with my new phone number, AND the phone company, which automatically set up my internet connection without me having to talk with anyone to go through a step-by-step procedure. I'm not certain with what ISP I should continue. Having read some other posts, I'm not sure that, if I continue with the phone company as my ISP, I'll be able to continue using my email address because of the different domain name. That situation is working now, BUT I'm being charged by both ISPs. At one end, your telephone company provides the wires that lead to your home. At the other ,your ISP provides you with an email account and email address. In between, the combinations connecting the two can get very, very confusing. Your ISP, as the acronym implies, provides your internet service - but what does that really mean? Your phone line connects to equipment at the telephone company's office where the phone and data parts are separated. 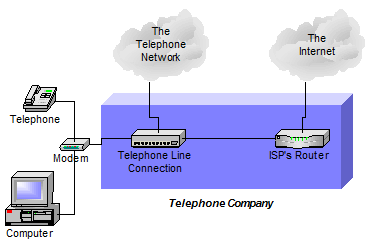 The phone is connected to the rest of the telephone network and the data is passed on to equipment that connects it to the internet. That "connect to the internet" involves just the basics: assigning your equipment to IP addresses and making sure that packets of data are sent and received properly. In addition to providing your actual connectivity to the internet, ISPs typically include additional basic services, such as email. Your email address is then most commonly on the phone company's domain, like @sbcglobal.com or @frontier.com. If you move to a location that's served by the same telephone company and ISP, then typically nothing has to change. Everything looks pretty much the same, except that you'll probably have a new email address as the new phone company acting as your ISP assigns you a new email address from their domain. Your old phone company may have given you a @phonecompany.com email address, and the new one gives you a @newphonecompany.com. Basically, your connection is simply routed through your new ISP, across the internet and over to your old ISP. You've got two email accounts, with two different addresses, and you can access both. Of course, the problem is that your old ISP will keep your old account active only as long as you keep paying for the service. Even if you're not using that ISP to actually connect to the internet, your account needs to be kept active to keep that email address functional. Unfortunately, ISPs tend not to cooperate with each other when it comes to moving customers. What that means to you is there's no way to move your email, or even have it automatically forwarded to your new email address; at least not without continuing to pay the old ISP to keep the email address active. The telephone company is responsible for providing other local ISPs access to the data connection to those customers who wish to choose a different ISP. From your question, it sounds like this is what you have. Your telephone company is not acting as your ISP. 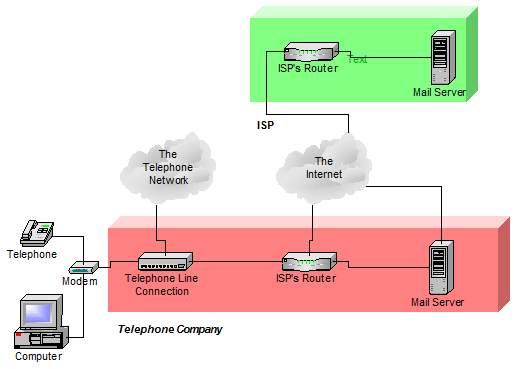 The phone service and the wires to your home are provided by the telephone company, but the internet connectivity and any additional services are provided by the ISP, a completely different company. It sounds like your installer set up your internet connection with the telephone company as your ISP, so your data is routed through them, and they also provide you with email services. You can still access your email from your old ISP through the internet as we saw above. Contact your old ISP and see if they can connect you at your new location. If they can (and if you're with the same phone company, I'm hopeful that they can), then you can cancel the ISP service from your phone company, and return to your ISP service from the other company, and all will essentially return to what it was prior to the move. What If Your ISP Can't Move With You? 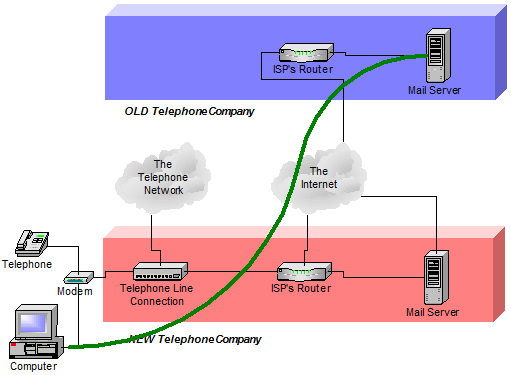 If your ISP can't service you at your new address - perhaps you've moved to an area serviced by a different telephone company that they cannot connect through - then you're pretty much out of luck. You'll need to choose a new ISP in your new location. As you've seen, it need not be your phone company, but it could be. Not long after I got my DSL service here at home, I got so fed up with the customer service provided by my phone company as ISP that I switched to a different ISP as you have. Same phone, same phone company, just a completely different company providing the Internet portion of the service. And providing a much better level of service. Much of the discussion here applies to all broadband providers, with one exception: it's only the telephone company here in the U.S. that's required to give competitive ISPs access to their customers. If you get your internet from any other source, you get the ISP provided by that source. The most common example is cable: if your internet is provided by your cable company, then they are your ISP, and only they can be your ISP. You can, of course, get your email and other services provided by other companies, but that would be in addition to whatever your ISP provides. All other aspects still apply: when you move, you may be able to access your old ISP's email account, but only as long as you continue to pay for it. Email addresses supplied by your ISP will not be portable, and unless you continue to pay to keep them active, they'll also be unable to be automatically forwarded to your new email address. How do I change my email address? Depending on the email service you're using and how much effort you want to put into it, changing your email address can either be fairly easy or fairly hard. Is there a way to keep my email address when I change my ISP? With a little planning it's possible to have an email address that does not need to change each time you change your internet provider. My ISP went under - how do I recover mail email and email address? If your ISP goes out of business it typically means you can no longer access data kept on their equipment. Prevention is really the only cure. Choosing an ISP: How do I choose a good ISP? Choosing an ISP can be difficult. ISPs definitely vary in level of service and quality. If the internet is important to you, so is choosing the right ISP. If you plan to move a lot and don't want to keep getting a new email address, it pays to register for your own domain and get a unique email address that forwards to whatever ISP you are using for email. That way, when you change ISPs, you don't need to change your email address, just change where email sent to your domain is forwarded. There are a bunch of companies that do that (e.g., godaddy, namescheap, cheapnames, etc.) and they all charge around $10/year. Why bother? Just get an Email account at any of a number of free sources (e.g. Gmail, Yahoo mail, Hotmail, Live Mail) forget about what ever your ISP provides. Then your Emailing is irrelevant to your Provider. Why bother? This is why: Are free email services worth it? 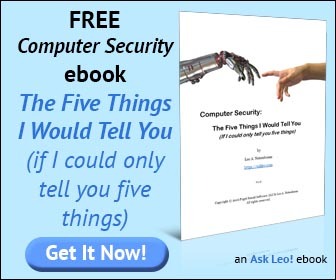 In short, too many people use free email services with no concept that if something goes wrong and they have no backup the email account, address and contents are easily lost forever. Some cable companies do allow other ISP's to provide internet service. I have Time Warner Cable but my ISP is Earthlink. When I first signed up, at least one other ISP was supported in addition to Time Warner's own Road Runner service. I agree with the Gmail approach. Living in rural Texas with small ISP startups and failures, I got tired of changing emails. I first went with Yahoo, but soon went with Gmail due to better spam filtering.